I’ve been trying to plan out litter the box placement in our new house for a while, but it’s proving to be a little tricky to do, even with so much more space at hand than we had in our studio apartment. My current ideal? 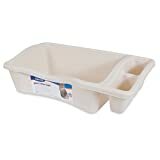 To place Avery’s litter boxes in spots in the house that have tiled (rather than hardwood) floors. In our house, this means I’m limited to using the bathrooms, since Avery’s not allowed in the kitchen, or a few other spots that have tiled flooring. There are 3 bathrooms he has access to, so this isn’t an issue. 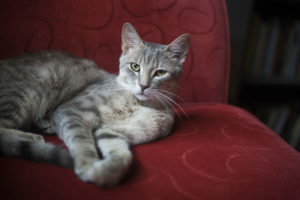 What I’m having trouble with is the fact that the spots I’d ideally place his litter boxes – spots that are far away from the washroom doors – are pretty narrow and slim. 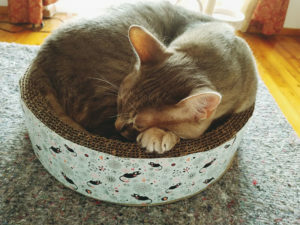 It’s not possible for me to fit either of the two litter boxes I already have on-hand – both Modkat litter boxes, which are quite wide, and square-shaped so it doesn’t matter which direction I place them, they’ll never fit into such a tight squeeze. The reason I want litter boxes as far away from the bathroom door as possible is pretty simple: Avery does this frustrating thing where, as soon as he’s done with the litter box, he’ll dart straight out, running as fast as he can and tracking a world of litter (no matter how non-tracking the litter I get is) behind him. I’m hoping that by having litter boxes as far away from the door as possible, he’ll manage to get everything off his feet before he leaves, containing all the litter particles inside the bathroom where it’s easiest to sweep up and get rid of. 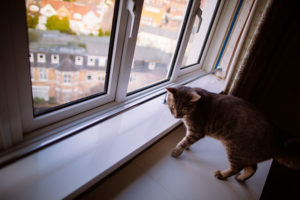 But that means I need to carefully plan out which litter boxes I want, making sure the measurements of whatever I grab will actually fit in those spaces. 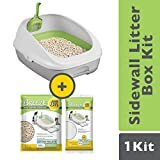 I figured since I was already looking for narrow, slim litter boxes, I’d make this post into a sort of cheat sheet for anyone else who’s doing the same. 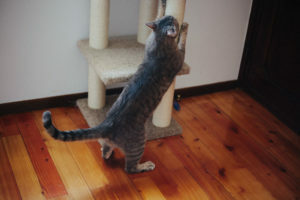 Like with the narrow cat tree article, I’ve written the measurements for every product I’ve listed so you don’t have to go directly to the product page compare between items and see at a glance which will fit your snug spot. Please double check the product listings for measurements before you buy any product, however. I did do my absolute best to make sure my listed measurements are accurate, but sometimes listing errors are made (and I may have copied them without realizing the error), and other times products are updated and newer versions have different specs. 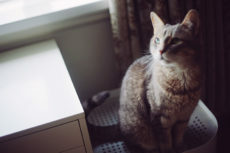 Use this list as a start to your search, rather than a final say on whether the litter box you like will work perfectly. 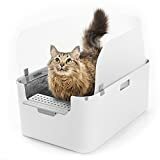 There are actually quite a large number of rectangular and oval litter boxes on the market, some that are way slimmer than others, so you do have a large number to. That being said, these days there are so many litter box varieties, you may first want to narrow things down first. 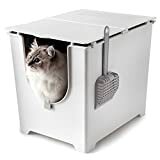 There are litter pans, hooded boxes, covered boxes with entry flaps, automatic self-cleaning litter boxes, top-entry litter boxes, and hidden cat litter boxes that I can think of off the top of my head, and they all have pros and cons. Not all of them are the easiest to grab in a slimmer size, so you can always have two or three varieties as viable at the back of your mind, and so can concentrate your search on those. I have done my best to list as many varieties as I could here. And to not go overboard with too much of the same, I’ve listed alternatives together in case you want to check out a few more of the same. If you can’t find exactly what you need here, doesn’t mean it doesn’t exist, just means you may have to do a bit more digging to find the perfect measurements, but I did my best to cover as much variety as I could. Good luck on your search, and do let me know in the comments below if you end up finding the right litter box for your slim space. 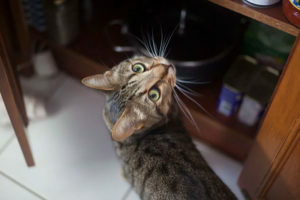 Some cats just plain are not a fan of using litter boxes that are covered in any way, shape, or form (oddly enough, I’ve known this for a long time, but have only recently discovered that some cats hate not having a lid on – learn something new every day!). 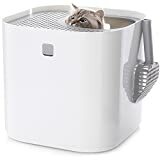 Just want a hooded litter box, but not really bothered about whether it’s got a flap in the front? I feel you. 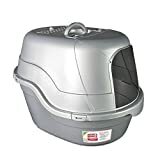 I used to have a Petmate Booda Dome for Avery (super cute litter box, by the way, just not all that narrow-space friendly) and it never once bothered me it had no flap. Actually, I can’t even remember if maybe it did had a flap, I just tore it off because it gave Avery easier access. Either way, flaps are just not all that necessary for everyone. 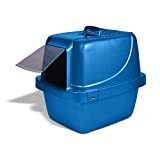 Thoughts on Narrow Litter Boxes? 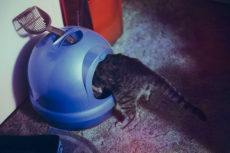 Have you ever wanted a litter box for a tight, thin space? 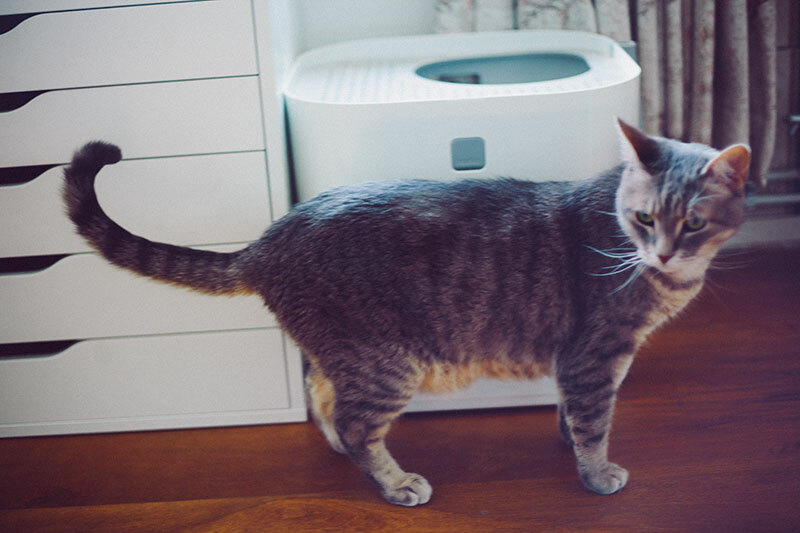 Ever found the perfect long, slim litter box for that space or was it too awkward to place a litter box in at the end of the day? 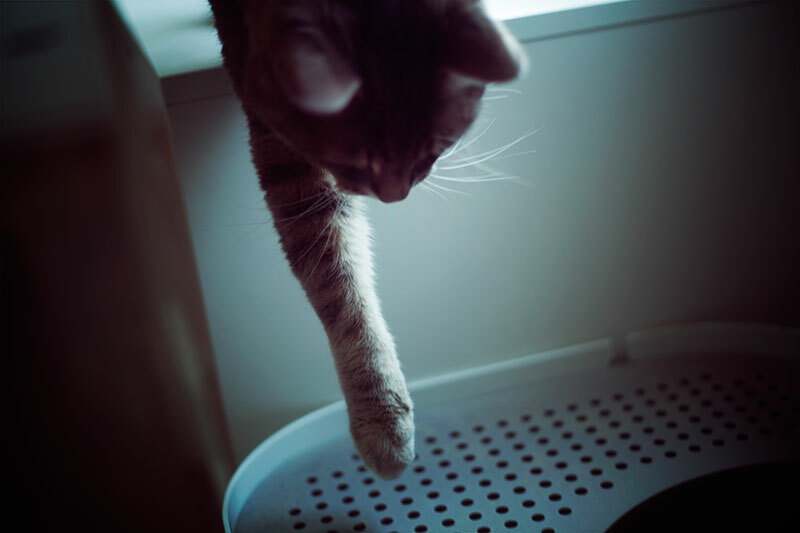 Do you have a preference in terms of the type of litter box you prefer to grab? Which kind (covered, uncovered, automatic, etc., etc.) do you like above others? Which types are you willing to use although they’re not necessarily your favourites? 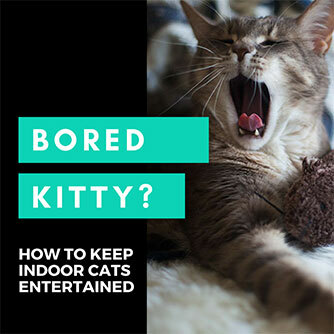 Does your cat prefer specific types of litter boxes? 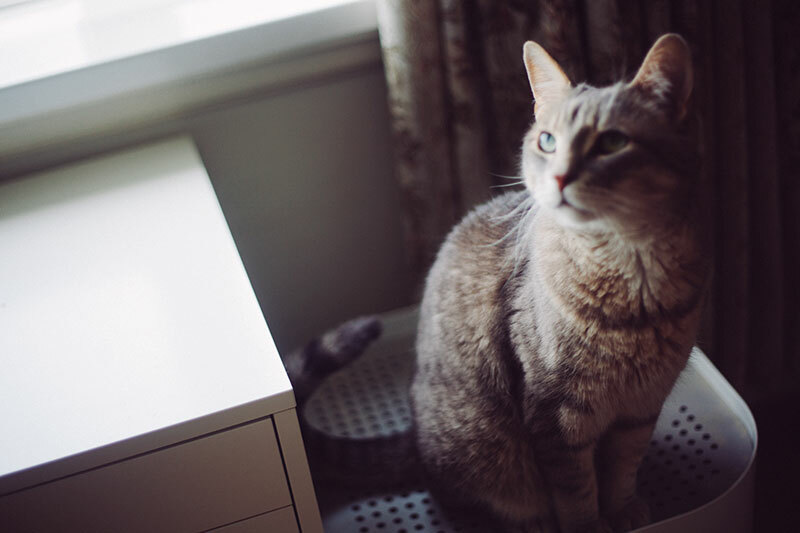 Also, do you have a preference between oval and rectangular or square-shaped litter boxes? 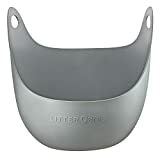 I personally prefer ones with corners since I feel like the oval/rounded ones are typically a waste of space, but I also know some people can’t stand rectangular ones because corners are often really difficult to clean. 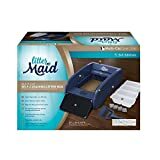 Just so you know, the Automatic Litter Maid is actually 20″ wide, not 11. I think you got the height and width mixed up. 🙁 I’ll probably go with the last ModCat because it has to fit in a space just shy of 15 inches. Thank you so much for the list! 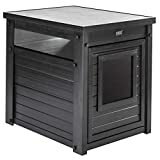 I have the measurements as “16.5×21 inches & 10.5″ high” – is this correct? Really do want to get those measurements right. Makes sense going with the ModKat – there’s not much that fits that snug that’s still a bit splash proof. I love their products so much, am sure you’ll love it! Thank you for your recommendations for the Modkat boxes! I’d spent an hour online searching for new boxes, saw Modkat on Amazon but wasn’t 100% sold on them, until your post! 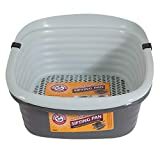 Unfortunately, I needed them within a few days but they’re not Prime items, if you are affiliated with Amazon, you won’t get anything from my purchase – I got 3 boxes UPS 2-day air shipped from Modkat directly. 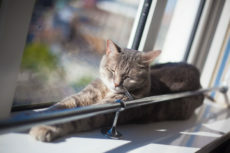 I think Modkat would benefit by your affiliation! Thanks again for this post – I’m about to check out your others! Wow, thanks JCB for such a considerate comment! Glad to be able to help with your decision. 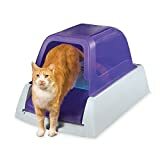 I know I would’ve loved a review like this to put me at ease over my purchase before I made it – they’re not cheap litter boxes, after all! Really like putting out content that I would’ve found helpful myself and am always incredibly happy to be able to help others make informed decisions based on my experience or research. 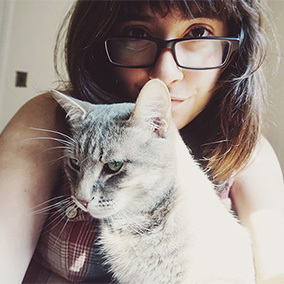 I am affiliated with Amazon and not Modkat, but no hard feelings whatsoever on you going through Modkat’s site – gotta do what works best for you! Doubt many people would care to leave a comment or even be this considerate about affiliates in the first place, so thank you. And hopefully, I’ve written up a blog full of posts good enough for you to stop by for a browse on every once in a while. At the end of the day, having a site that’s worthy of that is what’s most important to me. 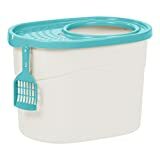 I just purchased an oval animal feed bucket, that hold 40 lbs of litter! I have one from a few years ago, and I just like the rounded look of the boxes, and they are nicely deep without being too huge. 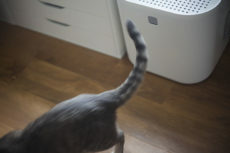 Chucky was a long cat, who needed LOTS of room to do his business, so we bought the biggest litter boxes we could find. Now, Manny and Chili Bruce actually put their front feet on the edge, and barely take up any room at all! However, I never want them to feel hemmed in, so I’ll keep the super large boxes…oval…until The Hubby yells at me for spending too much money on them…hehehe! Wow that is enormous and sounds amazing for the cats! And yeah, I find it hard to resist spending so much on them, too. And I only have one 😉 Actually, I’m beginning to plan out buying things for neighbours’ outdoor cats who stop by to play with us when they’re bored. Needless to say, reeling it in is definitely not easy for me!